If your one of many people who has lost their electricity in a dire situation, or just at the worst possible time, you are fully aware of how life-essential a generator can be. We often take electricity for granted, forgetting how important it is in our day-to-day activities and how lucky we are to even possess it. Generators are just an item that every modern household should be in possession of at some point in life, especially if you live in an area that is prone to any sort of natural disasters, if you work outside a lot, if you often need extra electricity for any reason, or if you just simply love to have fun outdoors while still being connected! This WEN 56200i 2000-Watt Gas Powered Invertor Generator is a clean, efficient option if you are in the market for a new generator. The WEN 56200i is a pure sin wave generator. It has an Eco-mode that automatically adjusts how much fuel it consumes with the plugging and unplugging of different power. This Eco-mode conserves much more energy and allows safer powering of sensitive electronics such as smartphones, laptops, tv’s, computers, and tablets. Not to mention, its design is very portable and lightweight, making on-the-go use stress free. We have a short video about the WEN 56200i where we give you the most important information you need to know before you buy. Want to learn more about the generator before you decide? Then keep reading and we will tell you more about it. This environmentally friendly portable generator produces clean energy that is free of any spikes in voltage and drops less than 3% total harmonic distortion. It is capable of generating up to 2,000 surge watt and has a 1,600 rated watt of power. The engine is a 79.7cc single cylinder 4-stroke OHV engine. This engine comes with a forced cooling system so that you never have to worry about the generator overheating. This bad boy also runs off of a highly efficient one-gallon tank that provides you with over 6 hours of power at half load, which equates to about a full 1/2 day of consistent power, depending on the load your using. On the panel, it includes warnings of output, overload, and low oil. The automatic shutter controls how much gasoline you can put in, depending on the wattage level you’re using at that time. This saves you a lot of fuel, meaning less money spent on fuel. 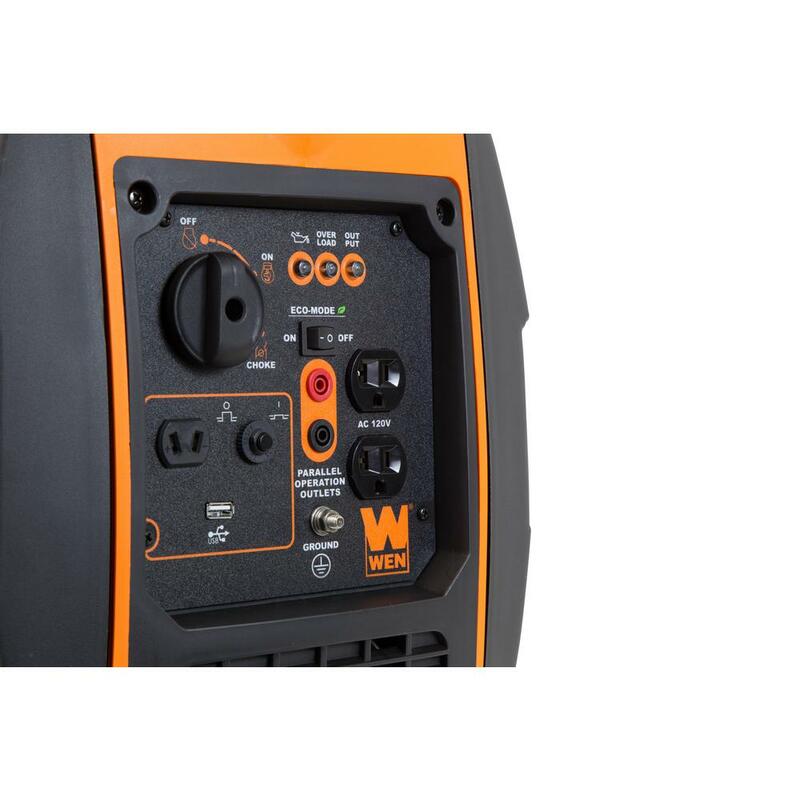 The control panel on the WEN 56200i also includes two three-prong receptacles, one being a 120V Direct Current receptacle, and the other being a 12V receptacle, on top of 5V USB ports which make it the perfect portable generator for outdoor activities such as camping, tailgating, or just when your electricity goes out on you unexpectedly. The easily adjustable power switch is the first switch on the control panel. Also located on the panel is a grounding nut, the three indicator lights for low oil, overload, and output notice. The eco-mode switch (which automatically adjusts its fuel consumption as different devices are plugged in or removed from the generator), the Alternating Current three-prong 120V receptacles the Direct Current 12V receptacles, the 5V USB ports, and parallel connection plug-ins for fast and simple hook-up of another added generator, when you buy the WEN 56421 Parallel Connection Kit for Inverter Generators that is sold separately. This kit can cost anywhere from $40 to $70 bucks depending on where you go buy it from. This portable generator is surprisingly quiet to operate, at an easy-on-the-ears 51 decibels. The US Department of Health and Human Services stated that it’s level of noise is comparable to that of an average conversation between two people. Its total harmonic distortion comes in at under 0.3 percent at no load and under 1.2 percent at full load. The WEN 56200i is a light, easy-to-carry 48 lbs, and packs away nicely at 18 by 18 by 11 by 18 inches. It has a convenient carrying handle with a sleek rectangular design that serves to give it a less blocky, obnoxious look. The parts and accessories that come with this generator include a spark plug wrench, a flathead screwdriver, the instruction manual, and a Direct Current Adapter Cable (alligator clip style). 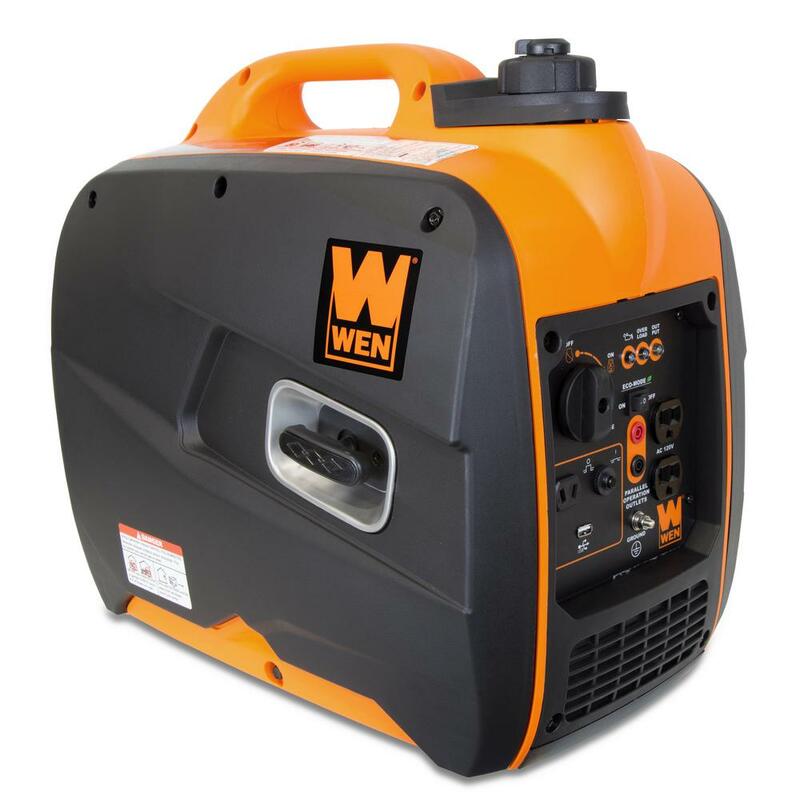 The WEN 56200i generator is backed by a 2-year warranty. Also, you can rest assured knowing that WEN has a nationwide team of skilled service technicians if anything goes wrong with your generator, as well as a helpful call-in customer service helpline for when you have any questions. The WEN 56200i’s price is $481.18. This may seem a bit pricey at first, but this is because this generator is different from your typical generator that is not an inverter. An inverter generator produces clean energy through its use of conversion of energy to Direct Current (DC) and the inversion of that energy back to clean Alternating Current (AC) power. This, as opposed to the classic generator that uses polluting fossil fuels to power up. Pure sin wave is the only mode of energy transportation used here. Inverters are also usually on the smaller side and weigh less. Today, inverter generators are being made with surge protection and ground fault circuit interpreters, which guard your equipment against spikes, blowouts, surges, and shocks. This is what this generator is equipped with. It has an average rating of 4 1/2 stars, with a great deal of positive, happy buyers. There are, however, a few complaints. 3. Lack of clarity in the manual for all the things that can be done with this generator. With that, let’s be sure to go over the specifics on this WEN generator real quick to make sure I get everything. It is EPA III and carb compliant. It does have a muffler. On top of the fuel gauge and automatic voltage regulation, this generator also has auto idle control. It has a horsepower of 2hp. My favorite thing about this WEN generator? It is EPA approved. For anyone who likes to know where their products originate from, this WEN generator is indeed made in China. Multiple customers say that they have used the WEN 56200i at somewhat high altitude (around 5,600 ft.) and it worked just fine for them. A few customers say that the oil they had the best outcome with was Mobile 1 Synthetic 5W-30. 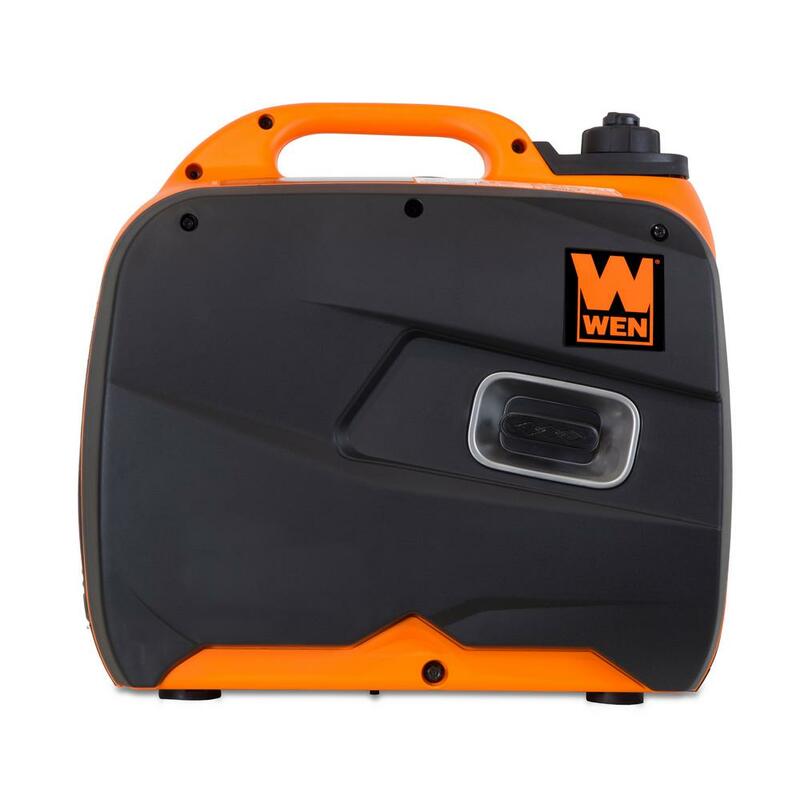 The parts and accessories for this generator that are sold separately include the WEN 56421 Parallel Connection Kit for Inverter Generators, (which you do have to buy separately to hook-up another generator), the WEN Universal Weatherproof Medium Generator Cover. the part 56200i-HA36 High Altitude Kit for 6,000 to 8,000 feet, the A5RTC Spark Plug, a fuel tank cap, an engine sensor for Oil, the WEN Ignitor, the air duct cleaner, an air gasket cleaner, the Carburetor Insulator Gasket, the Carburetor Gasket, a Recoil Starter, a breather tube, a Cylinder Head Gasket, a fuel gauge, a fuel filter, and a foam element air cleaner. Buyers of this generator frequently buy the kerosene funnel with flexible extensions and/or magic engine oil. Customers that bought this generator also bought a magnetic oil dipstick, Royal Purple Heavy Duty High-Performance Synthetic Motor Oil, or the WEN parallel connection kit for inverter generators and WEN universal weatherproof inverter generator cover I mentioned above. From what I’ve gathered on this particular WEN generator is that it is a great choice for the money. The only downsides are that it is usually only able to power items that are around 1,200 to 1,700 watts, despite its being labeled as a 2,000-watt generator, but depending on what item it is your trying to power up, it might work above these wattage levels. So, just to recap this generator to make sure we get all of the most important points, let’s go over customers’ favorite and least favorite components. First, the positive stuff. It has an ECO-mode and a very low noise level. It is an inverter type generator, making it better for the environment. It supports parallel hookup of two generators at once. It is portable and lightweight. It has various connection options, and it was made to be gentle on smaller technological devices. Now, comes the negative points. Customers say, despite the other buyer comments of it being a top-notch built generator, that the built-in oil container is very poorly designed, which in turn makes it somewhat difficult to pour oil in. The other big complaint is that it is not truly 2,000 watts of power due to it not being able to power certain level watt objects, even when they are under 2,000 watts. Lastly, pertaining to the prior mentioned complaint, users do not know what specific different areas of use they can use the generator for, and the instruction manual that comes with the generator is lacking in different ideas for uses, leaving some customers at kind of a loss for what to use their newly bought generator for exactly. In conclusion, this WEN 56200i generator is a great little generator for the money. It is environmentally friendly, easy to use, it has multiple connection options, and it works great at conserving your fuel, among other useful inclusions!